Hello and welcome back to my blog! 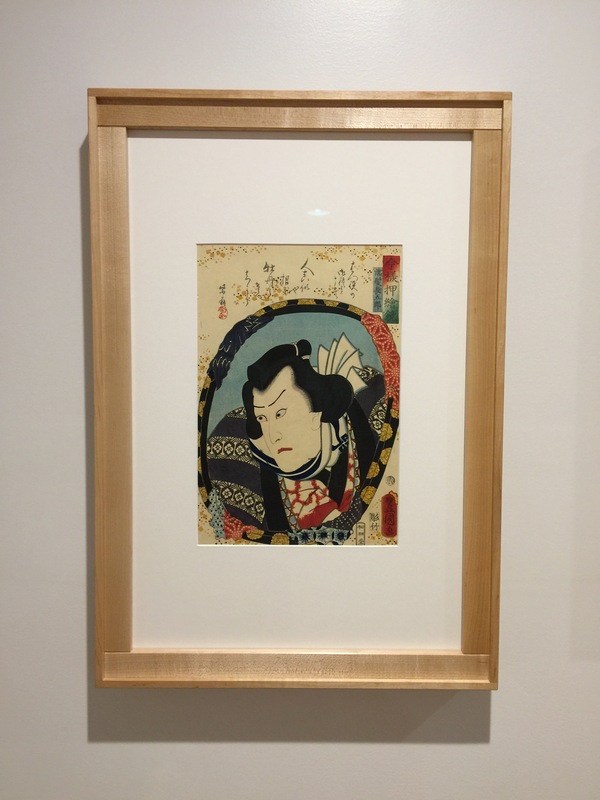 Today’s post completes the process of building a frame for an original woodblock print by Utagawa Kunisada. We left off with the inner frame having been completed. The next step in the building process is to prepare the outer frame’s stock. The stock has already been finish planed and next I tune up the edges to set them square and ensure that they’re flat. Now that I have a true and square edge I use my marking gauge to set the width and return to shooting setup to bring the board to that width. The benefit of planing to a mark at this point is that, because I’m working from reference faces, I will need to do nearly nothing to make the corners flush on the finished assembly. I’m cutting the grooves on the router table and then returning to a shooting board to prepare the edges. The handtool mantra continues with the router table, working from a reference face to ensure the groove lines up around the inside edge of the frame. I use a marking gauge even when cutting a groove with a router table, to ensure that the sides to do not split out in the grooving process, ruining the board. That spelching is one of the major reasons (noise aside) that the router table will find itself redundant within the year. Next I chisel out a relief in the inside corners so that the end grain can be planed square without spelching. This will be the tail board, I begin the layout by setting the height to my desired dimension. I’ve arrived at just over 1/2 of the thickness of the pin board. The reason being that a chamfer will absorb another 1/16″ and it allows my half blinds to be cutout without issue. A very shallow floor in a half blind can be very tricky. For these tiny dovetails I’ve landed on a 15 degree layout, this allows for dovetails that actually look like dovetails at such a small height (7/32″). Next I waste the center with a coping saw, then pare it back to the baseline and saw the shoulders to the baseline. No pictures of this process (sometimes I’m too much in the moment to stop and take a photo). Cutting out between the tails can be quite tricky on small dovetails, that was the case here. After completing the cutout, I transfer marks to my pin board. The board is slightly overlapped at the baseline and set square to ensure a proper fit up. It’s important to ensure that you are working from square at every step. Stacking errors can present issues later on down the line. Out comes the marking knife to complete the transfer. Now that they have been transferred, I can extend the lines from the end grain to the baseline. When cutting out dovetails and when starting on a corner I notch the corner so that the saw falls along side the line, rather than on the line. This reduces the chance of a gap in the dovetails. Alternatively one can saw close to the line and pare to the line but it’s a tedious process and unnecessary. Here is the saw in the cut, right along side the line. I begin wasting out the pin board by chopping down ahead of the baseline, then using my chisel, bevel up, to knock out the inside corners. I take these up one corner at a time, rather than the full width of the cut because it prevents damaging the inside corners of the pin board. I complete this step, then chop the baseline and here is the completed cutout. I feel that the ideal fit is a light friction fit, which should get tight right as it is seated, slightly more in softwoods, slightly less in very hard woods. Rinse and repeat three more times and we have two assembles ready to come together on the inner frame. After assembly I must clean up the corners with a plane, however, to do so I prefer to make chamfers first, helping to prevent spelching at the corners which will ruin my efforts. Spelching can happen with the chamfer plane as well, so it’s important to pay very close attention to the grain direction. Take a look at the grain and you will notice that it is going toward the left as it rises. I will pull the plane toward myself to ensure that I follow this direction. And the result is a clean chamfer. I will have to revisit these chamfers after the dovetails are flushed. Onto planing the dovetails flush. Finally I make my finish passes on the chamfers and here is the result. And the completed frame assembly. Having forgotten to photograph the back, I will show a picture of the previous frame. Next I finish the frame lightly with shellac. I have been dissolving shellac flakes lately to arrive at a shellac that I enjoy the color of on light wood. This is a super blonde. Sorry for the yellow background, it’s all that I have at the moment as this print will remain in this area. I have chosen to use a glass which prevents 99.9% of UV rays to penetrate to the print, however, because this is an original print I have still chosen to find an area of the house which does not receive direct sunlight. The shellac makes for a nice light glow on the planed wood. While Nuregami Chogoro contemplates his reflection, we can contemplate ours. Thank you for visiting my blog, I hope that you have enjoyed. Fantastic work, Brian. I think your frame suits that print perfectly. I also appreciated the additional details you included on your techniques. Great blog, keep it up. Thank you Robert! I was able to check our your blog as well, the workbench is coming along beautifully! That is a interesting frame. I was wondering how the first frame was going to fit in the overall scheme. I knew you didn’t do those bevels just to hide them. Thank you! Glad you are paying close attention! Absolutely, it’s very similar to a box frame like you would see around a pre stretched canvas, but set in and reversed. That’s where I developed the idea, then found it to apply well to this aesthetic (IMO).